'The Wellgarth' was founded in August 1911 by The Women's Industrial Council in a small building in King Edward Road, Hackneir. 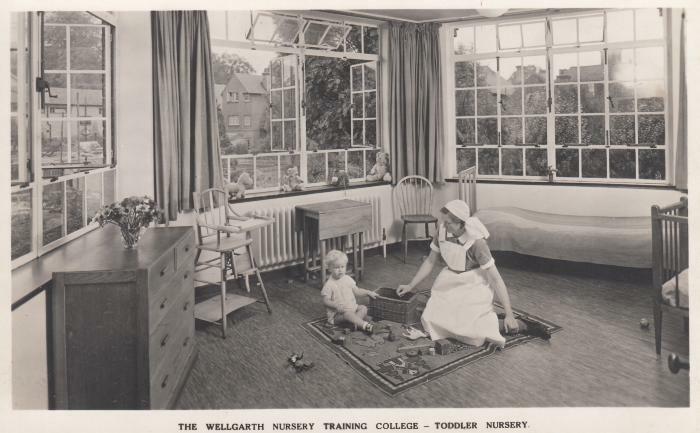 In 1915 the college was moved to much larger purpose built premises at 4, Wellgarth Road. This was in spite of very many complaints by the surrounding householders who did not want the 'poor' living near them. The staff, trainees and children totalled 60-70, half of this number being the children and were formed into family groups. A friend of Henrietta Barnett, Mrs Millington was the chairman of the committee. In 1928 the Warden was Miss Rachel Talbot who was still in office in 1937. The instrtrction included simple physiology and hygiene, including an elementary knowledge of childish ailments, their symptoms and treatment. A study of child nature, leaming how to play sensible healthy games with children and making toys with materials that were to hand. They also learned cookery. laundering , mending and making children's clothes plus housewifery. The college closed in 1979 and sold to the Youth Hostels Association. They were refused planning permission to build staff quarters in the grounds 1992. The building and site were sold by the YHA in the early 2000s. The building has now been converted into apartments.